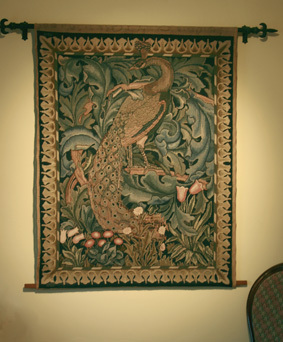 A customer recently asked me if I could stretch a tapestry just over a metre long by half a metre wide – far too big for the stretching frames I have. So my first thought was ‘No, I could not’– swiftly followed by my second thought which was ‘Why not?’ I have stretched a big tapestry before. In the 1990s I copied a section of William Morris’s Forest Tapestry from blown up photographs after attaching the canvas to a weaving loom that I just happened to have! 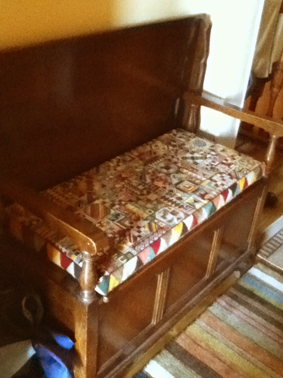 It needed stretching when finished, but it was awfully big and It was my 80 year old mother who had the answer. We put down carpets of towels, pinned it to my bedroom wall and sprayed it thoroughly – wondering all the time what could possibly go wrong! Well nothing did. Eventually it dried, perfectly straight and now hangs in my living room. However, my bedroom has been decorated since then and I am not inclined to repeat the exercise. 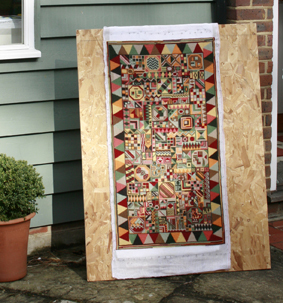 So for this new tapestry, I bought a big board, a lot of little nails, found some old towels and stretched the tapestry on the board with the added advantage of being able to take the board outside into the sunshine to speed up the drying. The edges went slightly wavy where the nails had pulled, because there was so little spare canvas at the sides – but the whole thing was back to square. Off it went to my customer and in no time she sent me this picture. All the wavy edges are hidden away in the seams underneath! She told me later that she had made up the pattern as she went along. You don’t always realise what extremely gifted stitchers you are working for!